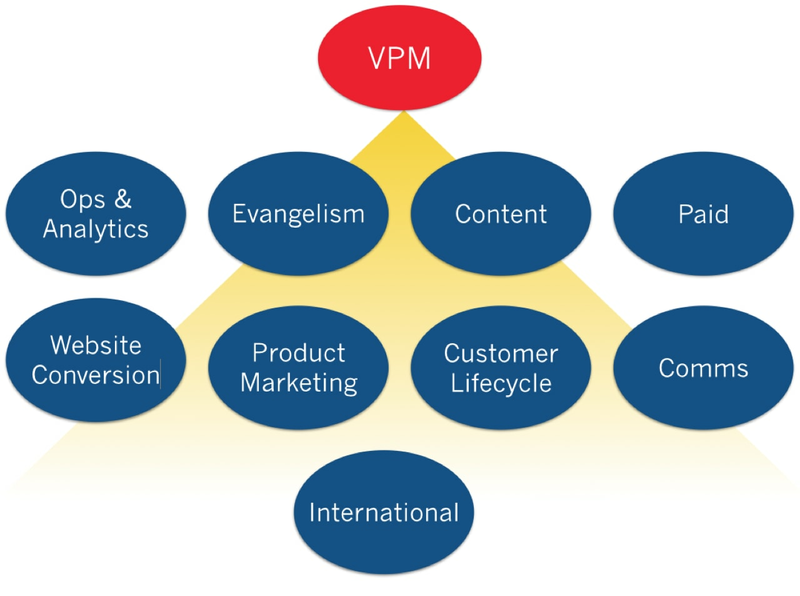 As a SaaS startup scales from finding initial product market fit to building its go to market organization, one of the most important goals in building that go to market organization is developing a multifaceted marketing team. Marketing’s role in SaaS sales has expanded to the success of SaaS companies as customers prefer to educate themselves more than they have in the past. Many early-stage management teams perceive marketing to be limited to two functions: demand generation and brand building. But that is a myopic perspective which fails to appreciate the complexity of the subject. Bill Macaitis, former CMO at Zendesk and current CMO at Slack, counts nine different marketing disciplines: content marketing, paid acquisition, evangelism, communications, customer lifecycle marketing, product marketing, website conversion optimization, analytics and international expansion. There might even be a few more including analyst relations, events and channel. That’s quite a lot of expertise required from one department - and it doesn’t just appear overnight. Many early stage SaaS companies focus on a single channel of customer acquisition at the outset. That might be Facebook ads, content marketing, app stores, or evangelism. At some point, the demands of company will outstrip the capacity of the channel to supply leads. For some companies, this channel saturation occurs relatively early on, perhaps under $10M in annual recurring revenue. Other companies might reach tens of millions of revenue. Regardless of when it happens, it will happen. To build an enduring company, the business must be prepared for that inevitability by diversifying its marketing efforts. The most effective marketing teams develop go to market cocktails, combinations of strategies that enable the company to continue to grow consistently as it scales. As the cost per click on Google or Facebook increase with intensifying competition, these marketing teams lean on content marketing, referrals or channel-driven leads to hit their numbers. More importantly, these marketing teams develop these skills before they need them. After all, the marketing strategies of one company cannot simply be copied and pasted into another business. Optimal marketing isn’t an off-the-shelf product, but a bespoke suit tailor-made to a business. Marketing is a balance of art and science, an equilibrium between the right message and the right medium. Marketers experiment to discover and sustain the balance, in the midst of a dynamic marketplace. As competition intensifies, industry trends evolve, and the company’s product and positioning in the market advance, marketing must readjust, retool and retune. Diversifying the team’s skills early on is a fundamental strategic advantage for SaaS companies. Invest in it before your business needs it.